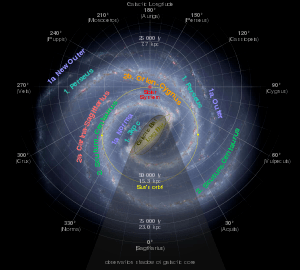 The information presented in this blog post is, mostly, from the Atlas of the Universe website. Interpretations of that information are my own. The radius of the bubble containing the known (visible) universe is about 14 billion light years, give or take an inch or two. This damp dirt ball we call home is a minor planet orbiting a rather ordinary star in the Orion Spur of the Perseus arm out in the boondocks of the Milky Way Galaxy, which is a member of the Virgo Cluster of Galaxies, which is one of billions of galactic clusters wandering about within the knows universe. Who needs mythical biblical miracles for numinous and inspiration when Astronomical Science has shown us just how magnificent our universe is ?? The first thing I view when I wake up my computer in the morning is the Astronomy Picture of the Day ( APOD ). I find this to be a good way to start my day. 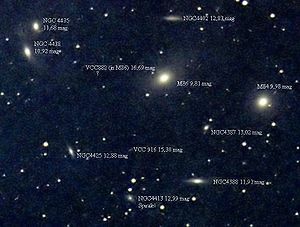 Numbers used to describe astronomical size and distance are best estimates, rounded to the nearest whole number. I am not aware of an estimate of the total number of planets in the universe, but based upon current knowledge of exoplanets, it would be a very large number, indeed. Of course, only one of those numberless planets is known to support living creatures, but it is reasonable to think that many of them would support life, and that some would have intelligent life. All of which makes one a bit humble, doesn’t it? This entry was posted in Miscellaneous Musings and tagged APOD, Astronomy Picture of the Day, Dwarf galaxy, galactic cluster, galactic group, galaxies, inspiration, Milky Way, numinous, Orion spur, size of universe, stars, universe, Virgo Cluster. Bookmark the permalink. 3 Responses to Size Matters ! I think we (YOU and I) are a bit more than “nothing”, and we are certainly a part of the universe. Yes, talking about religion, especially trying to have a conversation with religious folk, is pretty much a waste of time.